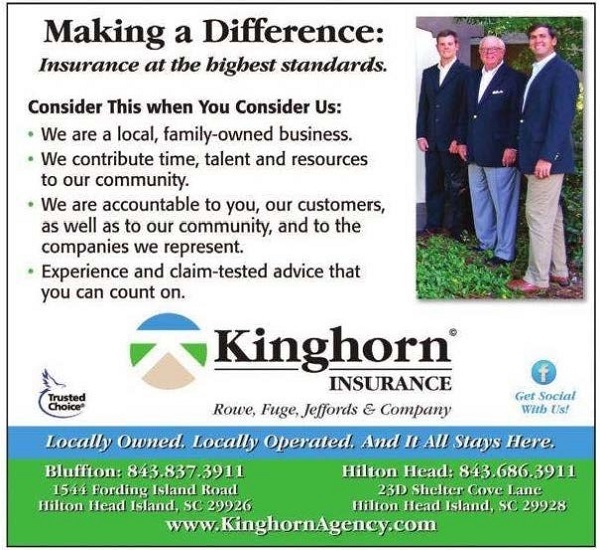 At Kinghorn Insurance Agency of Hilton Head Island, and Bluffton, our teams work with you. Earning your trust is our most important goal. We are fortunate to have an experienced and professional staff. Our “Kinghorn of Hilton Head Island Family” shares the responsibility of satisfying our customer’s needs. At Kinghorn Insurance, we are strong advocates for continuing education for members of our staff. Many of them have advanced national designations in their specialty areas. Kinghorn Insurance Agents are experienced and knowledgeable regarding the challenges of placing insurance in our Coastal location. Our experience enables us to offer competitive products that properly protect our customers. We are locally owned and operated. Although we are a community-oriented business, we represent financially strong national and regional insurers that offer a wide selection of insurance products. We also have access to brokers for the placement of specialty and non-standard insurance requests.